Well, I have to admit I was NOT expecting this. Novation have been shifting their portfolio from synthesisers and drum machines over to controllers and audio interfaces over the last few years so, they’ve wrong-footed a lot of folk by dropping this bomb to mark their 21st anniversary (they’re even older than dear old RAD it would seem) and what a very incredible bomb it is. The original Bass Station holds a very dear place in my heart: it was the first analogue synth I ever bought and it contributed to my now unhealthy obsession with synthesis for which I am very glad. It also sounded absolutely amazing. Raspy, gnarly and practically untameable at points, it was made to tear strips out of speakers and packed a stupid amount of punch for it’s price and size. I’m sure it’s ancestor will do just the same (it is, after all, a fully analogue signal path just like the original) and I’ll be seriously tempted to get one just for old time’s sake if nothing else. Those of you who aren’t as dewy eyed and sentimental about this particular launch as me are probably asking “what distinguishes this from the current batch of sub £500 analogue mono-synths on the market?”. Well, the Novation Bass Station II has two fully analogue oscillators both with selectable waveforms (sine/sawtooth/triangle/square with PW) and a third sub oscillator for full-on bottom-end phasing bass mentalism. It has a switchable filter, which is pretty interesting because it will allow you to select between ‘classic’ and ‘acid’; the second of which is a diode ladder filter design much like the beloved TB303 as the name would suggest. It also has an analogue effects section, which is admittedly pretty much just distortion but I still think this is going to add a useful bit of grit to the sound and I can’t wait to hear it in action. It has the usual array of LFO and envelope section and, as most of have come to expect, the addition of USB for quick storage of patches and convenient MIDI interfacing to your DAW without a secondary box. It also has an arpeggiator and SH101-style step-sequencer. Yep, this machine is under £400 and it has a step-sequencer! That is bang for your buck right there! Having said all that, you needn’t take my word for it. Go check out the competition: namely the Arturia Minibrute, the forthcoming Korg MS20 reissue, DSI Mopho and the Moog Minitaur and judge the winner yourself. I for one can’t wait to see it in the flesh. Hopefully we can rekindle some of that old magic together. 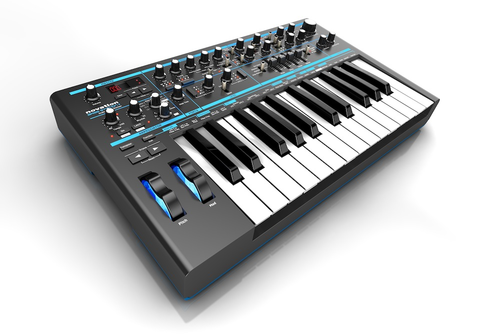 Ladies and gentlemen… The Novation Bass Station II.